�����The recent decline in bullion has caused generic U.S. Gold coins to fall, some issues substantially. Common low grade Twenties are down $100 since the last Wholesale Price Guide was printed. The Tens and Fives are lower by about the same percentages. In addition, the $5 and $10 Indians have lost much of their inflated premiums in the last two weeks. During the past few months Indians were in such strong demand that premiums had forged way beyond what had been normal for common generic dates. �����On the positive side we continue to monitor higher wholesale prices for rare collector coins. Early Half Dollars remain very active with buyers searching for common to better dates in all grades. Accurate grading is necessary and eye appeal will bring higher prices. Mint State coins, especially MS63 and higher, are very much in demand. �����Higher prices are also reflected in Seated Dollars, both Mint State and Proof. 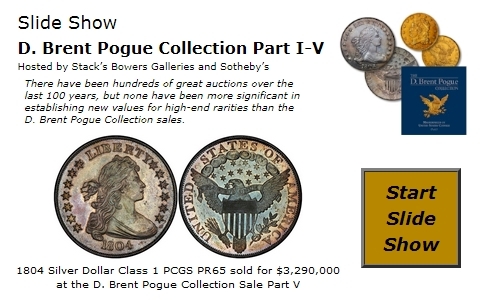 Dealers and collectors are finding that these coins are not plentiful in 65 and higher. In many cases, aggressive buyers only have a potential of 2-3 coins certified and most of the time they are not available. Interest in Early Gold has not waned with buyers continuing to look for properly graded coins prior to the 1840s. Again, the highest grades attract premium prices.